NAF Love the Skin He's In Skin Salve for horses will soothe and comfort irritated areas of skin. NAF M Power for horses should be fed as part of a regular training regime to support healthy muscle power, function and help develop fitness and stamina. NAF Mare Foal and Youngstock for horses is a balanced formulation to support optimum rather than maximum growth. NAF Mint and Garlic for horses is a natural tonic to help maintain vitality and coat condition. NAF Mint for horses is a feed supplement to help maintain appetite and digestion. 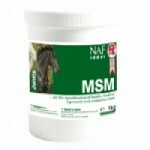 NAF MSM for horses is a feed supplement providing organic sulphur especially useful for stabled horses. NAF MSM Ointment for horses (Natural Animal Feeds) is a protective, natural first aid ointment for minor cuts, grazes, sores and skin irritations. NAF Naturalintx Aloe Vera Purple Spray for horses is for use on minor cuts and abrasions to augment the bodys natural healing processes. Has the added advantage of discouraging flies.